It may look like an ordinary Bluetooth mobile telephone headset. But don't let the sleek, hi-tech design fool you. The CS10 is also a personal sound amplifier and is completely customizable to help you hear everything happening around you with crystal clarity. In addition to three preset amplification profiles, you can use your Android smartphone or tablet, or a Bluetooth enabled computer to personalize the device through our CS10 Customizer App. And best of all, the CS10 is surprisingly affordable. See videos below. Each CS10 Personal Sound Amplifier features Bluetooth connectivity, Customizer App for use with Android® smartphones, our proprietary sound quality algorithm, and a comfortable customizable fit. Will the CS10 work with my iPhone?" To download the CS10 Customizer app for Android smartphones and tablets, visit the Google Play store. Click to download the Mac OS X desktop version of the CS10 Customizer app. Click to download the Windows desktop version of the CS10 Customizer app. You may need to adjust your virus protection software to allow the file to download. Each CS10 comes with two rechargeable batteries that can each provide up to 9 hours of listening time on a single charge. Batteries can be recharged using either the included power adapter or by connecting the supplied cable to any USB-enabled computer. The CS10 comes with three different sized ear tips (small, medium, and large) so you can select the most comfortable, snug fit. 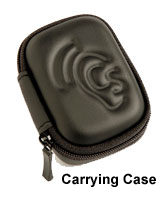 The convenient zippered carrying case holds the CS10 as well as both batteries. Wherever you are, you are always ready to Get Back in the Conversation™. A. Hearing aids are designed to help compensate for specific types of hearing loss and are meant to be dispensed by qualified professionals and worn by the patient all of the time. PSAPs like the CS10 are designed for occasional use for amplifying sounds that are inherently difficult to hear. PSAPs are not intended to diagnose, treat, or cure any disease. If you believe you have hearing loss, we encourage you to seek help from a qualified professional. A. Since the CS10 is so highly customizable we recommend that you spend more time with it than a typical demo. We expect that it will take you a while to find the best settings and become accustomed to the CS10. Therefore, we offer a no-risk 30-day money back guarantee. If you use the device for 30 days and don't feel it's providing a benefit we'll take it back, no questions asked. Q. Can I wear the CS10 all the time? A. We have designed the CS10 to be comfortable enough to wear through an entire lecture, or even an all-day conference. However, if you feel that you need full-time hearing assistance, we recommend that you see a qualified professional to determine if you have treatable hearing loss, or need hearing aids. Q. Can I move my CS10 from one ear to the other? A. Unfortunately, no. Specific versions of the CS10 have been optimized for either right ear or left ear use. Q. Can I use a CS10 in both ears? A. Yes, you can use both a left and right CS10 simultaneously. Just be aware that they need to be set up independently and only one at a time will pair with your smartphone. Q. Is the CS10 available in other colors? A. To paraphrase Henry Ford, "...any color you want so long as it's black." 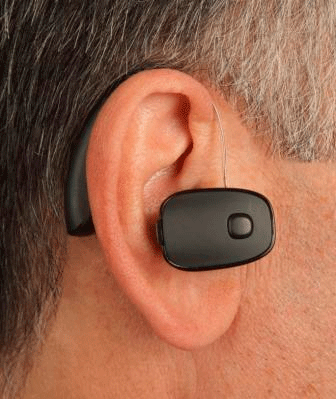 The CS10 was designed to look like a Bluetooth headset, not a hearing aid, so we decided to go with a look that is consistent with that type of product. Feel free to drop us a line if you have suggestions for future products. Q. Do I need a specific smartphone to use the CS10? A. No. The CS10 is ready to be used as a Personal Sound Amplifier right out of the box. There are three preset amplification profiles to choose from in addition to a personal volume control. The CS10 can also be used as a headset with any Bluetooth enabled phone. Our free CS10 Customizer app for computers and Android smartphones allows you to tap into additional features and to further personalize your CS10, but it is not mandatory. Q. How long does it take to charge the CS10’s batteries? A. You can expect to get up to 9 hours of operation from a single battery when used as an amplifier. Battery life will be somewhat reduced if using your CS10 as a Bluetooth headset for phone calls. Q. How long can I keep recharging a CS10 battery? Q. How do I pair the CS10 to my mobile phone? A. First be certain Bluetooth is turned on in the mobile device you are trying to pair to. In most devices you can go into the “Settings” options to find the Bluetooth menu where you can turn Bluetooth on or off. The CS10 will only attempt to pair with a device for the first three minutes after powering up. Once the mobile device is ready, reattach the battery on the CS10 and your mobile device should discover the CS10. You may have to select the CS10 on your phone as the Bluetooth device you want to connect to. We have also created a video tutorial to help you pair the CS10 to your phone. A. With mobile communication devices you should be sure that you have good signal strength and reduce as much ambient noise as possible. You can optimize the performance of the Bluetooth link of the CS10 by being sure to use it within 10 feet of your mobile phone. Q. How can I access the CS10’s Environment modes? A. To access the Environment modes, you will need some version of our free CS10 Customizer app. Once you select any profile in the app (personal profile or preset profile), the back button on the CS10 changes function and will allow you to toggle between the environment modes. One beep is your baseline profile. Two beeps is “Restaurant Mode” with more directionality to help you hear better in noisy locations. Three beeps is “Entertainment Mode” with a more balanced frequency response for musical or theatrical events. Q. How do I get the CS10 Customizer app? A. You can download the Android version of the app from the Google Play store. There is a link from our home page, or from the CS10 Customizer app page of our website. Both Windows and Mac OS X desktop versions of the app can also be downloaded from that page of our website. Q. How do I tell which mode my program button is in? A. When you push the program button on the back edge of the CS10, you will either hear a voice saying “Preset 1”, “Preset 2”, “Preset 3”, or you will hear a series of beeps. If you hear the beeps, your device is in Environment mode. One beep is your baseline profile. Two beeps is “Restaurant Mode”, and three beeps is “Entertainment Mode.” If you hear the voice, your device is in Program mode, where you can switch between the three preset amplification profiles. Q. Can I make the CS10 more comfortable to wear? A. Absolutely. 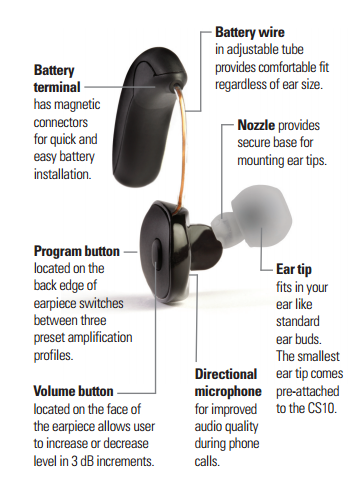 The CS10 is user customizable with a number of adjustments you can make to get the perfect fit for your ear. First be sure the ear tip is the right size. 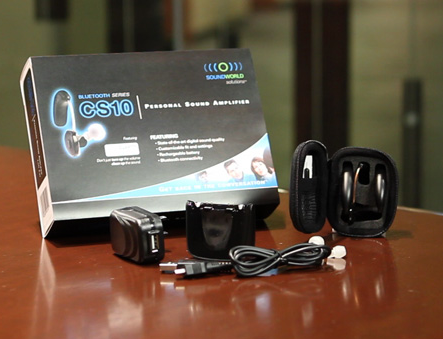 Three different sized ear tips are provided with the smallest coming attached to the CS10. The perfect fit should be snug, but not tight. You don’t want the CS10 to be loose or flopping around when you wear it. Next, you can gently bend and adjust the length of the battery wire so the CS10 lies more comfortably on your ear. 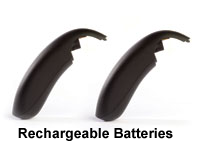 Grasp the body of the earpiece in one hand and the battery wire in the other. Gently slide the wire until you reach a comfortable length for your ear. See our “Getting Started” video for a demonstration. Q. Can the CS10 be worn with with my eyeglasses? A. Absolutely. We have a number of beta testers, customers, and some members of the SWS team wearing the device comfortably with their eyeglasses. The best option is to have the earpieces of your eyeglasses nearest to your head, then nestle the battery from the CS10 between your earpiece of your glasses and your ear. A. Preset 1 and Preset 2 each have less low frequency emphasis than Preset 3. If none of those settings adequately reduce the bass response, you can use our free CS10 Customizer app on your smartphone or desktop computer to create your own personal profile or make specific individual EQ adjustments. Q. Why would the sound from my CS10 become muffled or garbled? A. This is likely due to the natural buildup of wax. 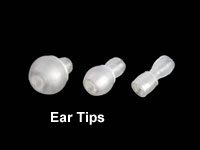 We recommend that you clean the ear tip and nozzle of your CS10 once per week. For a demonstration of how to use the wire loop cleaning tool that came with the CS10, please see our “Cleaning” video. You may also need to clear any wax build up from your ears. Q. What can I do if my CS10 sounds thin or tinny? A. It is normal for your brain to take some time to get used to amplified sounds. However, if the high frequency response is distracting or annoying, you can turn down the volume or try a different factory preset with a more balanced frequency response (Preset 2 or Preset 3). Be sure you adjust the volume each time you select a different preset. You can also access an Equalizer screen through our free CS10 Customizer app where you can set specific EQ settings and set your personal sound profile. Q. What do I do if my CS10 is squealing? Avoid putting your hand or other objects near the CS10. Putting a firm surface next to the device will reflect sound back into the microphone creating a feedback loop (squealing). If none of the previous solutions work for you, try reducing the high frequency response of your CS10 by adjusting the presets with the button on the back edge of the CS10, or by using our free CS10 Customizer app to make specific EQ adjustments. A. 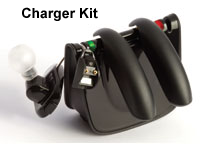 First be certain that the battery is charged and attached properly. If the unit is powered up, but no sound is coming out, try pressing the button on the face of the unit to increase the volume. If that doesn’t work, check for obstruction of wax that may have built up in the ear tip or nozzle of the CS10. See our “Cleaning” video for details. You may also need to remove wax build up in your ears. Q. Can I stream music or other audio content through my CS10? A. Unfortunately, no. However, we are considering this capability for future SWS products. Q. Will the CS10 help with tinnitus? A. The CS10 is not a tinnitus masker. However, some people who suffer from tinnitus have been able to find comfort through amplification like the CS10 can provide. "I just put in my new CS10, walked outside, and I heard a thousand birds singing. It was an emotional moment for me. I won't lie, I cried a little bit. I know that hearing birds chirp might seem like a dumb everyday thing to most people, but I haven't heard them in 20 years. You people are Saints, for creating an affordable option for normal people. I could have easily gone the rest of my life without ever hearing the birds again. Thank you so much." - Duane K.
"The best $299 I ever spent. The CS10 is a wonder (a mystery) of engineering. I have no idea how it is able to somehow set priorities on all the sound around me, but it does. It transmits what I want to hear and does a good job backgrounding most of the other sounds. Somehow it separates the wheat from the chaff—algorithms, magic, who knows? Thank you Sound World Solutions for the CS10, I'm back in the world again" - Richard K.
"It is the most comfortable Bluetooth I've ever owned and the sound enhancer is a life saver. I have very expensive hearing aids but never wore them because of the hassle. Problem solved. Thank you Sound World Solutions !!!" - Claude B. "My sister is a speech therapist. Bought a pair of CS10s to try out on me. My husband got hearing aids ($4,000) last year and I was jealous, but my hearing tests did not qualify me to spend that much money. Still, I couldn't hear the birds in my garden. I put them in and have not taken them out while I am awake. My world has expanded. I hadn't realized how closed in I really felt. The background noise is something I want to hear! It is not bothersome. My sister says that's because my brain can still filter the background noise, while my husband's brain went too long without practice. Thank you for giving me back the real world. I feel depression lifting every day!" - Nancy G.
"I purchased one of these units for my 90 year old mother in law who was reluctant to spend thousands on hearing aids. She put it in, turned it on and I no longer have to repeat everything three times. 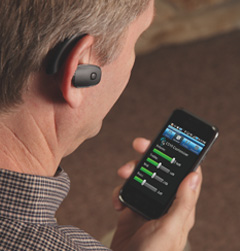 With the 30 day money back guarantee I would recommend trying one of these before shelling out for hearing aids." - Brice W.
"When the conversations with my father turned into shouting matches, we finally decided it was time to look into something that would enhance his ability to hear. A friend mentioned the CS10 Personal Sound Amplifier, so we thought we would check it out. It looks like a Bluetooth headset and he can even connect his phone to the earpiece. His ability to hear has improved immensely and we no longer have to keep the radio and TV on at their highest sound levels for him to hear. He loves it and never goes anywhere without it. I loved the price tag." - Lisa O. "It is so comfortable I wear it everywhere except in the shower, or while sleeping." - Tom W.
"I didn't realize how much the product was really helping me until one day at work when the battery died before I could install my backup. It was like the customer I was talking with took a giant step 20 feet backwards." - David J. "The only problem is breaking my habit of saying 'what' when people are talking to me. I used to have to any time I was in a crowded restaurant or other noisy environment. But now I can hear them just fine." - Tom K.